wonder if the EA and Dartmoor National Park Authority know they are backing this sign ? ...and prince Charles...... Think I'll ask them..... anyone else care tyo join in a mass ask? Excellent news - by implication they are clearly happy for kayakers to paddle it at any time. Regards the dates stated IF its reffering to migratory fish ie Salmon and Sea Trout, winter is the closed season for angling as well on the Dart, I think? The close season on rivers was bought in by the landed gentry to take advantage of the mayfly hatch in May June so they could fly fish in peace without the rude coarse anglers hogging the best swims. it is why many regions had different close seasons to tie in to the mayfly hatch. The need for the coarse close season was said to be that fish needed to spawn and needed to be left in peace. But that was all bolloks. they wanted the rivers to themselves. Unfortunately many anglers like the tradition of the close season, many calling for it to be reintroduced on lakes, and to my mind are their own worst enemy. There is no scientific reason for having the close season. some anglers say it makes us look caring and look good to the general public which is more bolloks as the non fishing public don't give a monkeys about us. In 1993 the close season on lakes was lifted and in about 2000 the close season on canals was lifted but on rivers it continues as an Anachronism in a modern world. I second idc's remark: not sure where the sharing bit happens? I'd make good use of the allowed stretch in the allowed period, and fully document the size and nature of the parties, plus what anglers you see and any interesting angler behavior. If someone has the time and energy, that person might go upstream in the winter months and document what use anglers are making of the river (if allowed). American Whitewater has been waging a fight to get paddler access to the 25 miles of the upper Chattooga, the "headwaters," for maybe 15 years now. The Forest Service, the governing agency, pretended to be interested in potential conflicts between introduced paddler and fishermen after introduced (non-wild) trout. Key to our getting close to a settlement has been showing that, other than at a few more easily accessed points, fishermen, hikers, and campers are making only light use of the river corridor. Thus it has been hard for our courts to see why paddlers appearing only on the ~30 days per year when the Headwaters flow high enough for paddling would be any problem for other users, who mostly don't do anything with the river when it is high. Before you try going to court, put some observations and figures in front of the managing agency and say, how about allowing paddlers more use time, and access to upper reaches in the winter? Measured steps and further monitoring will allow an agency to justify changes more easily than to demand the river be opened entirely to paddlers, all the time. "There is no legal right..." That sounds to me very much like lawyer speak for "While we know its not illegal to paddle, we want you to think you are not allowed"
Just need to look on the club website at their catch reports, just remember to knock off a couple of pounds to the documented figure. My opinion is they arnt sharing they are just leaving canoeist with the left overs. Nice of them to be concerned that the winter months would be normally good for canoeing, all the rain we have in the summer months it would be just as good if not better as the winter months havnt been getting as much rain. Basically admitting it is the Dart fisheries who put up the signs in the absence of there being any signed, permissive access agreement in place between the riparian owners and the British Canoe Union. It is to tell us paddlers when we can and cannot paddle. The sign looks like another fishery "try on". Chances are that the use of the above names is without permission. Carry on canoeing when there is water. I particularly like this one, "....releasing his 12lb Salmon"
It looks more like a 4lb fish to me. This notice is clearly the work of the fishermen without any permission from the other parties mentioned. Unless they have a legal title to the soil of the river, fishermen have no rights or powers concerning navigation. Their registered titles are in general profit a prendre for fishing rights. This just means that the thing they own is not a physical object. They only own the right to fish. If they wish to make any assertions to do with navigation they should be asked to produce their titles and show where it says they have powers over navigation. If they quote Rawson v Peters, point out to them that Lord Denning made a clear separation between disturbance of fish and control of navigation by refusing an injunction restraining navigation but giving leave for an application to be made in the County Court. Somebody needs to write to them and get them to put up or shut up. They have no legal rights concerning navigation. Unless they have a legal title to the soil of the river, fishermen have no rights or powers concerning navigation. And even if they own the soil of the river the private riparian rights they gain are secondary to the public rights of navigation evidenced in Magna Carta and the 1472 Act for Wears and Fishgarthes. all of us, and try and elicit what they are trying to achieve with these scare tactics. If you felt it was relevant,you could copy in any relevant bodies or individuals to help shed light on this problem. SK8R, are you really at a place called 'Lake Caregiver' ? Having a nice chat with the EA Facebook. Please feel free to reply to them (keep it polite). I am awaiting a email reply from the Duchy of Cornwall in regard to an email they sent me. At the moment EA say it was not them and Duchy seem have gone quiet when I talked about the legal writes they have to block access on the river. I await there reply. Sorry to hear about your OH, maybe you can get away on a trip be for the Winter comes again ! Perhaps people should be writing to Prince Charles as the Duchy of Cornwall is cited on the sign. I fully intend to ignore this sign as I do not recognise Canoe England's right to negotiate away our rights of navigation. Perhaps people should be writing to Prince Charles as the Duchy of Cornwall is cited on the sign. I wrote to the Dutchy yesterday. I fully intend to ignore this sign as I do not recognise Canoe England's right to negotiate away our rights of navigation. 1.4 Make these arrangements publicly available to all canoeists for self regulation. 1.5 Encourage canoeists to follow the guidelines of such arrangements. 1.6........The decision whether or not to canoe is the responsibility of the individual canoeist(s).......... An AA shall neither confirm nor reject any party’s views or interpretation of the legal situation. Last edited by KeithD; 27th-June-2012 at 08:19 AM. Yes. I know what I am about. I have just got my fingers burnttaking my local fishing club to court to get compensation for their restriction of my navigation. The fishermen have no legal argument whatsoever but I can't bring my case, only the Attorney General can bring the public nuisance element of the case. Letters are likely to be answered by Fish Legal, who have already tried my patience to the limit. Anyway, a lone campaigner is easy to dismiss as a nutter. We want everyone pressuring them and every other fishery claiming to control navigation, so here is a proforma letter that can be used in this case and adapted for general use. You appear to be claiming that you have a right to control navigation. In general there is no legal basis for such claims. In Rawson v Peters, Lord Denning made a clear separation between disturbance of fish and the control of navigation by refusing an injunction to control Mr Peters' navigation but giving leave for an injunction to be sought in the County Court. So, unless your titles to your fishing rights show that powers to control navigation have been conveyed to you, you have no legal right to restrict navigation. If within fourteen days of the date of this letter, you do not present documentary evidence of your entitlement to control navigation, I will consider, and let it be generally known, that your claim to control navigation is unlawful and be prepared to present your failure to substantiate your claim to control navigation as a defence in any civil action you may subsequently bring. May I suggest a tab on your web site for proforma letters to assist anyone who wants to put the pressure on to change the Zeitgeist. Spot on Keith. I haven't lost the big picture but I have reverted to the military doctrine of limited achievable objectives. WE can challenge them to prove every claim that fishing rights gives them control of navigation. They will not be able to prove any. If they have no say they can be ignored but they have to fail to substantiate their claim first. Get writing everyone. Thank you for your email regarding the new sign that had been erected on the River Dart at Newbridge. Coincidently, both myself and Kevin East have attended meetings in the South West with Dartmoor and Exmoor National Parks Authorities this week. We visited the Dart between Dartmeet and Newbridge and found the location of where the sign had been erected. The sign had been removed and only the wooden frame remained. Following discussions with Dartmoor NPA, it became apparent that they were fully aware of the sign and had consulted with the Environment Agency and Dart Fisheries Association but failed to consult with us. They did however acknowledge that it would have been beneficial to have consulted with Canoe England regarding the ‘wording’. They have assured us that they we will be do their best to involve us in any further signage. However, there are no plans to replace the missing sign at the moment. Nice one Quicky. If they are in retreat then this looks a good time to hit them with my proforma letter to keep them moving backwards. Is anyone writing? Taken literally (and yeah, quite mischievously ); it's not even wrong (in part). 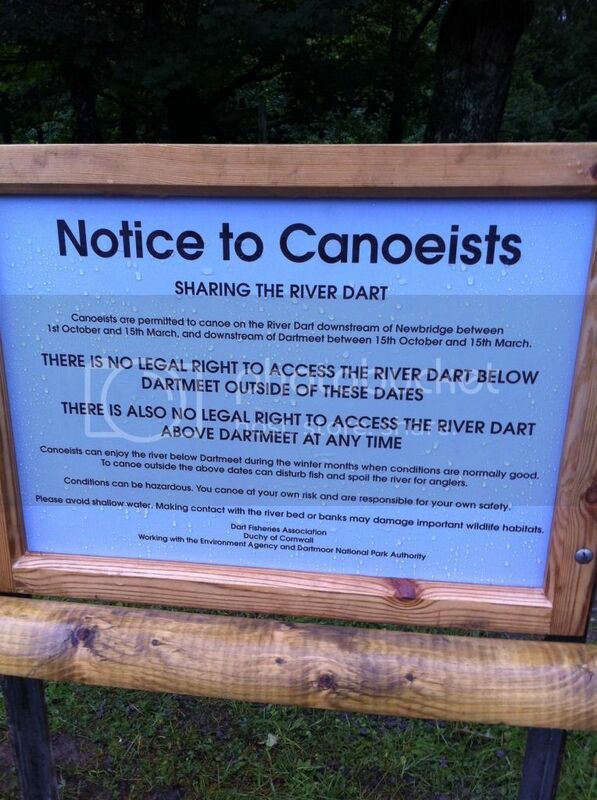 "There is no legal right to access the River Dart below Dartmeet outside of these dates". Hmm, ... so that's everything using the river from Totnes down to the open ocean in trouble then is it? where it is legally bound to do so. Letter wording adapted (so they don't just think "another circular") and sent. Have we any signwriters on the forum? We could produce our own sign saying the exact opposite and concrete it in directly in front of theirs. Please post their reply if you get one. In any case after 14 days contact the Duchy of Cornwall and inform them that the fishermen have failed to provide documentation to show they have a legal right to navigation. State that the matter of navigation is between navigators and the owners of the soil and that fishermen have no legal right to interfere. Ask the Duchy to what extent they own the soil of the Dart. Ask them if they know of any legislation or exercise of statutory powers that may have extinguished, on the river Dart, the general public right of navigation affirmed by 1472 An Act for Wears and Fishgarths. Once they give a negative answer we have established a PRN on the Dart which it would be difficult for anyone to challenge. This looks like a way to simply take back the our rivers. Of course, we don't know what the snags there are yet but it has got to be worth a try. It will be learning experience. I have no interest in the Dart, or navigable rights o the Dart but I am interested in the case, having similarities as it does with the situation on the lower Wye. Signage on the Wye is of a similar type, as Dougoutcanoe has highlighted on the Wye thread. Canoeists may get signs removed on the Dart, but others will spring up fairly quickly, bearing similar messages, if not similar logo's. As some of you know, I'm trying, through the Wye Salmon Association to organise a meeting between various interested parties to get some kind of agreement going on the Wye which we are all happy with. If we can do it this could then be rolled out over Wales/England. I really can't see how navigable rights are going to change unless we all sit around the table together. As an angler and former paddler I know that it is unreasonable to restrict access for canoes to certain months of the year. I was very much in favour of agreed access on the Wye when the WUF first proposed it. It transpires (and I'm happy to admit I was wrong) that agreed access on the Wye and elsewhere is, in the main not agreed, either by anglers or canoeists. It is instead a rubber-stamping mechanism which the EA, WUF, and the Welsh Assembly have agreed to. CanoeEngland may have changed their stance somewhat, but in real terms what does that mean? Have they told anglers and landowners? You can bet all you have that they have not. One other point which strikes me, for those who think that Magna Carta, a big Court Case and change in the law will allow immediate unrestricted access. This, as far as I can tell (I've emailed the author but had no reply as yet) is based around unrepealled rights of navigation dating back to the 16th Century (please correct me if I'm wrong on this one). What if the Courts decide in favour of the landowners? What if a new law seals legal restrictions on access. None of us know how such an action will turn out, and none of the canoeing bodies seem willing to find out. Last edited by davidh; 4th-July-2012 at 10:32 AM. I thought the same so googled it, from what you say about your problems the result would have been believable!! "Rules are for the obedience of fools and the guidance of wise men"
Grp Cpt Sir Douglas Bader CBE,DSO,DFC,FRAeS. Ollie said "We paddled the Upper tonight at lapping slab and A4 sheets of exact same format of that blue sign were placed on paddlers windscreens..We never saw an angler but it just confirms that they do not want us paddling in the summer at any level so think there is a long way to go with any possible negotiations". I think this just confirms that anglers and paddlers aren't speaking to each other. What if the landmark case went to court and found in favour of canoeists and kayakers? All fishing to stop whenever a canoe or kayak appears within 100 yards of an angler (for example) - how are signs or window stickers going to help the angling case then? On the Wye we think the salmon breeding disturbance problems (which don't exist according to CanoeWales and the EA, although we have photographic proof) can be sorted out fairly easily and amicably compared to access problems. To be clear - some anglers are also causing salmon breeding disturbance problems and we aim to sort that out at the same time. Regarding access, we already have people willing to talk to me as an angler on this forum (thanks SOTP), and we have anglers and at least one landowner on the upper river willing to sit round the table with grass-roots canoeists, and that has to be a start. It's only taken since my first post last Saturday to get this going too, thanks in large part to the Wye Salmon Association, who recognise that access agreements on the Wye don't work for anyone (apart perhaps, from those who drew them up ). It shows there is some willingness for constructive dialogue. This will be easier for us on the Wye because we already have the landowner, ghillie and angler contacts on the upper, middle and lower river, but no-one is denying it will be a slog. Last edited by davidh; 5th-July-2012 at 05:50 AM. I am confused by your example of saying "All fishing to stop whenever a canoe or kayak appears within 100 yards of an angler". The aim of the Access Campaign is to allow access to the rivers for ALL, and for rivers users to cooperate together for mutual benefit, e.g. boats to slow down and pass anglers/swimmers with care, anglers to move their lines out of the way of boats/swimmers IF they can, combined working parties to clear rubbish etc. Canoeists are not in competition with anglers, we should all be able to use the rivers together as already happens on some rivers, including some very busy rivers. Looking at this problem from a canoeist perspective. There are very few stopping points. Canoeist after paddling for a couple of hrs or maybe more need to stretch their legs and have a bite to eat. So innocently may get out in a place that they think is ok but isn't. We need more stop points (not to be confused with put ins) that are away from spawning grounds. Discrete marker points (I hate signage) could show where these points are and how far to the next point. I feel that this would give canoeist what they need and there would be no reason for them getting out of canoes apart from when there is low water. Low water can be an issue at some places where there are also gravels; a shallow channel to one side of the river would give passage and protect the rest of the bed if it is used for spawning. this channel would also possibly give fish passage too when water is low. Pacifying anglers is secondary to the fish and in turn this might also pacify the anglers. I don't really like shouting across the water to anglers, "where would you like me to pass" mainly because it breaks the peace and quiet. Banksmen used to use signals to crane drivers and it worked, simple gestures that became pretty much universal. Why can't something like this be used. A small gesture defined by a hand movement relative to his/her torso would mean near side or far side and middle meaning middle. We use gestures allot in everyday life, sometimes without realizing it. It would also get anglers talking a little even if it is only sign language. Waits for coments that some anglers already give them gestures. Last edited by Ratty; 5th-July-2012 at 03:06 PM. Sorry about my example - I should have made it clear that that would be a worst case scenerio from an angler point of view. Otherwise I agree with you completely - that is what SHOULD happen. On the Dart I am led to believe, and certainly on the lower Wye, it definitely does not happen at present. What is happening at the moment is that other people, not combined river users, are making the decisions for us. So for instance on the Wye we have The EA (official body) and the Wye and Usk Foundation (grant-chasers), along with some of the Welsh Assembly (official body) making an access agreement no-one agreed to. Access Campaign - who is driving that? Anglers involved anywhere along the line? Unless we talk to one another and take some ownership of an agreement to suit all river users we can only ever have imposition of the wishes of one group over another. I have heard that this may be the case in certain quarters............. .
Great illustration of what paddlers know to be common sense and anglers don't consider - and why should they? It's exactly why we need to sit around a table. After many years of being told that: "canoeing is illegal on this river" , "rivers are private", "you are not allowed to canoe here", including threats of violence, etc, etc, I am finding it very difficult to be anything other than suspicious of agreements. Perhaps angling England and Wales is on the back foot. They may be realising that access to rivers cannot be denied, they have lost their assumed right and the status is heading back to how it should be, free and legal access for all. There has been no successful legal action against access to rivers for canoeing. In terms of the anglers argument of "we pay for this" we all pay for the artificial stocking of rivers with fish, through our taxes, that are then caught by those who have paid a small proportion of the true cost. So tax payers have been unwitting helpers of anglers for many years, subsidising their hobby to the tune of many millions of pounds per annum. As for sitting around a table to discuss these matters, we canoeists have a strong position, don't let it be diluted by so called agreements. If talks are to reduce the hassle we encounter then that would be good but the rivers are there for all of us and excluding either side is not right. The only agreement I require is that we travel peacefully by canoe or fish in peace and that all accept this. Including the idiot at Ingestone on the Wye and any others like him. I felt I had to say that. The navigation of the River Wye from Hay to sea is covered by an Act of Parliament and it includes, incidental use of the banks provided no damage is done. The proliferation of signs declaring, "private land, no landing" are illegal, the private land only starts at the top of the bank where it meets the flood plain. Access and egress points are to allow river users to join or leave the river, to and from a public place and are a separate issue to the banks and stopping for a break. Have to say as a beginner who has just started this great hobby/sport/way of life I find this whole topic very frustrating and confusing. Weeks ago the types of signage being encountered would have scared me from this new hobby, I would have believed I was doing something wrong and believed the signs,,,,However I have now been enlightened thanks to this great forum, I have done lots of reading and digging around and my understanding and findings indicate that we do indeed have a right to use the rivers as much as anybody else. Douglas Caffyn has it spot on in his booklet "Boats on our rivers again". The evidence is there, it makes perfect sense and is easy to understand. The real issues seem to be getting slightly overlooked, which is how and when we use the banks for incidental use. Brief stops to stretch legs, make a brew, go to loo, safety reasons, navigation blockages/obstacles would all be permitted under Incidental use as would portage. Provided you do not go above the highest part of the bank there would be no grounds for trespass prosecution. To me it is the Incidental use that needs clarifying and a set of guidelines determined and put into print that can be agreed upon. Lets presume I'm canoeing down the Wye, I see a gravel bed used for spawning fish, now would the Landowner's and fishermen prefer I carry on regardless and paddle over the gravel bed OR exercise my right to Incidental Use and portage around the gravel bed by using the bank, If I was a fisherman I know which my preference would be. As far as I see it we are nothing more than a minor inconvenience to the angler and they cry wolf by using all the made up environmental issues to stop others using the rivers, heck they are the ones who create swims by cutting holes in the bankside vegetation, why can't we just use these same holes when vacant for exercising our right to Incidental use, after all they already did the damage. People trying to play god, sheesh. Sorry for the rant, I'm just a newbie paddler but I'm infuriated that these signs illegally try to stop me enjoying the water. PS I agree totally with Dougoutcanoe's comment above. Of course we (canoeists) want better access. I suggested that the wye salmon association should talk to paddlers because of conservation. Part of us (canoeists) using our access responsibly involves us having a knowledge of what to look out for and how to conserve and protect the fish and other wild life in our rivers: - not so that they can be caught, but so that they thrive and are there for everyones enjoyment. I don't know what a redd looks like, I doubt I'd spot one from on the water if I did, but if the wye salmon association and canoeists can talk to each other and share information about what we each want from the rivers, then that can't be anything but good news for all. Part of canoeists responsibly using the rivers will effect access. There may well be places/times when it would not be responsible to paddle a certain section and the fishy people can let us know that. Equally I'm sure that fishy people would benefit from knowledge of what canoeists want. Unless we talk and share information, how will we make progress? Just repeating the fact that we think (know) we have legal access will not make things happen. We might not like it, but fishy people do honestly believe that they have a claim on the rivers in some respects and we won't change their views by repeating "Douglas Caffyn" or "MagnaCarta" (I put that in just for Sk8r!) at them. Rattys ideas above seem totally sensible to me. Communication and sharing knowledge and resources has to be the way forward. Putting our hands over our ears and chanting caffyn, caffyn caffyn won't get us anywhere, and fishy people doing the equivalent won't help either! Setting aside the issue of "chanting", I disagree! The situation now has changed from what it was 20 years ago and it's not because of the positive engagement of Defra, the wonderfully effective River Access Campaign or the reservoir of trust and mutual understanding built up negotiating access agreements. It IS because paddlers and those that have opposed recognition of the public right of navigation have a better understanding of the undeniable EVIDENCE of the historic right of navigation presented so thoroughly by Douglas Caffyn and the total lack of any coherent argument that it has been ended by any statute, exercise of delegated powers or the decision of any court. The cornerstone of any campaign for the recognition of the general public right of navigation must be to continue to promote the evidence that it already exists and has done for the whole of recorded history. What if the Courts decide in favour of the landowners?What if a new law seals legal restrictions on access. None of us know how such an action will turn out, and none of the canoeing bodies seem willing to find out. "canoeing bodies" have been intimidated by fear of the costs involved in litigation but there has also been no court cases BROUGHT by "angling bodies" and landowners and this is because success depends on evidence that the historic right of navigation has been ended and no-one has made any credible suggestion as to when and how this took place. Whilst all conflict is ultimately resolved by discussion and negotiation, don't enter into talks on a basis of fear. A better mutual understanding of the different perspectives of anglers and canoeists is constructive, more and better information on the needs of spawning fish may be helpful but co-operation on the provision of access to and from rivers away from the immediate areas where fish are likely to spawn would also be a positive step. In reality weren't you the one complaining loudly about a certain ghillie, and about signs on the lower Wye? In spite of your "strong position"? Doug, the fact is that your strong position is on paper only. It's a great starting point for canoeists, but I contend that until we have good agreements between river users we will continue to see animosity on both sides. The probability is that eventually a third party will step in and impose an "agreement", as has already happened on the Wye. Luckily the "agreement" we have on the Wye is voluntary, and not a legal restriction, and can be sidestepped. I emailed Douglas Caffyn this week and have had replies back from him to the effect that he will be interested to see our joint river-user proposals, when they eventually emerge. Unfortunately I have to go to Leicester today to earn a crust . So nothing more from me on here today (do I hear cheers ?). The good news is I'm back in the Wye valley tonight - and will be too kn*****ed to post.. The Wye is hammering down at the moment and set to rise - poor for fishing, but good canoeing water for the weekend. Last edited by davidh; 6th-July-2012 at 07:12 AM. I am the one complaining about the infamous gilly, believed to be Lyndon Cobley at Ingestone. His well noted bad behaviour and aggressive manner towards river users needs kerbing and I am again asking the police to take action in terms of a public order offence. The signs I complained about were created by WUF and included logos they did not have permission to use, they have been removed. As I have stated before, most of the harassment canoeists receive is from pseudo officials of fishing organisations with no authority other than their self proclaimed position. Sometimes complaining loudly is the only way to be heard. The strong position of canoeists is not on "paper only" but is shown through the action of thousands of paddlers using rivers. Last edited by dougoutcanoe; 6th-July-2012 at 09:31 AM. Absolutely right, actions as well as words. If I lived close by, I'd be organizing a mass trespass!!!! And invite the press! I love a good fight!!! STOP IT! It's not trespass! These issues come to the fore so much more on heavily used rivers than on the minor ones. The Wye is a good fishing river (I am told) and also at a low grade sufficient to attract a lot of tourist canoeists. The Dart is a very popular whitewater river, one of the best. The level of agro is much less on the less populary rivers although frequently evident. I think it has been said time and time again, the average angler's experience of canoeing is a two minute interruption during a days fishing. It really is not too much to ask. People should get on quietly paddling their favourite rivers, behaving like you would if you met a little old lady in a narrow street. Would your granny be pleased with your manners? Would your granny be pleased with your manners? That's exactly right. If everyone (fishists, canoers and kayakmen) would just think about what their granny would think of them and their behaviour, then most of the difficulties would be over. I forget who it is (apologies if it's you) but someone often tells us "we have no arguement with most fishermen we just want to share the river." Good manners cost nothing and smooth over many misunderstandings. "..pseudo officials of fishing organisations with no authority other than their self proclaimed position." If an EA official they have to give name and id number when talking to you. If they don't or can't the are not an EA official. IF they say you cannot paddle ask if it is there opinion or the EA. IF they say EA get there name and number and carry on paddling. IF they say there opinion get name and number and carry on paddling. These 'officials' are being looked into at the moment.